The scouts of Black Badge. The Boy Scouts and vending machine sandwiches aren’t really similar, though they are both designed to provide people with the things they need: guidance, information, or, well, nourishment. But the Scouts and food-dispensing automatons both take on new meanings in this week’s best new comics. This version of the Scouts is more than just an organization teaching young kids how to be handy, resourceful people who can dive into the wilderness with ease—it’s a place where the world’s deadliest assassins learn how best to take out their targets. Vending machines are still mostly focused on food, sure, but the larger story behind them and their owners is far more complicated; in truth, it’s darker and bloodier than you could possibly imagine. All of this is to say that this week’s comics turn the mundane into something absolutely extraordinary. A police officer discovering a finger in his sandwich. 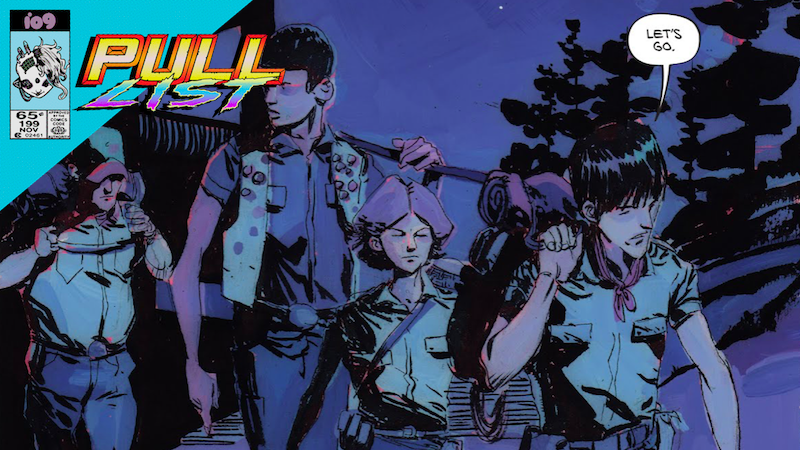 What Aftershock Comics’ Hot Lunch, from writer Eliot Rahal and illustrator Jorge Fornés, lacks in superheroism, it makes up for real world generational drama that’s more captivating than any tired plot focused on a universe-ending threat. Hot Lunch is a crime story about a feud between a food-supply company run by the Arab-American Khourys and the Irish mob who once worked with the family to deliver their products. When the Khourys seize the opportunity to expand their business beyond Minnesota’s borders without the mob’s knowledge or assistance, the criminal organization retaliates in ways that are cruel and monstrous. As dismembered bodies and dead children begin to pile up in relation to the ongoing feud, the local police launch an investigation, and the youngest generation of Khourys are forced to reconcile with the fact that the family business has put them all in danger. Jordan Khoury Sr., the patriarch of the family and head of the business, is confident that he can handle the increasingly deadly threats to his empire and family, but Dorothy, his daughter, has her reservations. Willy realizing that he and his fellow scouts have been sent on an assassination mission. If the Boy Scouts actually gave out merit badges for mastering important life skills like hand-to-hand combat and espionage, more kids would probably demand to become part of the organization. Boom Studio’s Black Badge imagines a ragtag but dedicated group of kids who, after years of study, hard work, and collecting every badge there is, are given the chance to become Black Badges, members of an elite squad of child assassins. The concept behind the Black Badges is a rather ingenious one—no one would suspect a handful of innocent, wilderness-exploring kids armed only with compasses to be trained killers, and that’s what makes the comics’ heroes so deadly. Willy, the newest member of the group, isn’t sure if the assassin life is really for him, but a whirlwind mission in North Korea leaves him with no choice but to accept his new destiny.